Coming out of the station follow Peckham - Camberwell - Vauxhall - Westminster Hwy/A202. Turn left onto Harleyford Street. Continue to the end of the street and turn left onto John Ruskin Street. 2nd right is Bethwin Road. Turn left onto Kennington Park road. First left onto Cooks Road turning into Dale Road. You will come to a dead end, turn right and then right again onto Bethwin Road. 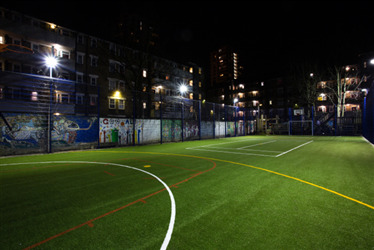 The Kennington sports pitch is a great space for 5aside football for training, tournaments, matches, events, casual games. With the pitch available for one-off bookings or for regular block booking. The Kennington Football pitch is easily accessible from the following locations - Kennington, Oval, Elephant and Castle, and Stockwell. Hire a football pitch in Kennington and play your 5 a side football game. Kennington pitch hire is available on a per hour basis and can be block booked. Popular South East Venue. Venue does have a small kitchen available for use in the main playground hut.